Following the success of the Romeo and Juliet competition here is another. Win two tickets for Anna May Wong Must Die! Anna Chen's personal journey through the life and crimes of Hollywood's first Chinese movie star. Sunday 20th September at 7.00pm. Early start time means that you can get to Guildhall or other gigs afterwards. What is Anna saying ? If you post anonymously please also email so I know who you are if you win! Closing date is Friday 18th September. We will then post the winning entry here. 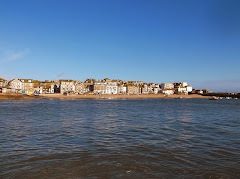 Sunny Day in St Ives ! !